This is the first of my multi-part series on knots. So tie yourself down and get ready for a ride. What to do with all that tape! Gaff tape, paper tape, maybe even some duct tape, it all needs to go somewhere. How useful these tapes are but they’re a strange shape and bulky to store or carry neatly. Now, don’t get me wrong, you can buy tape lanyards for a relatively low price, but why do this when you can make a ton of them for only a few dollars! This is an extremely simple thing to do and it will make your life much easier. Oftentimes people will just simply tie a single piece of rope in a knot with the tape threaded. While this is an option, it can cause a few issues. Mainly, in order to get the tape off (or more on) you have to untie the knot, this isn’t very practical since it takes extra time to tie and retie the knot. Get a piece of rope of about 18 inches in length (something thin, yet sturdy) My favorite is paracord. You can get 50 feet of the stuff for around $7 and it comes in a wide range of colors. What’s that? You don’t think you need that much rope? Well get it anyway. Paracord is extremely useful for tons of things, both on and off the set. Get a carabiner. I prefer smaller ones, they hold the weight of the tape really well and are more compact than the bigger ones. Tie a small looped bowline knot at both ends of the rope. You want it to be wide enough to easily feed the carabiner through, but not too big as to where it can get caught on things, if you mess up, just untie it and start over. Once you have the right size, I like to cut the leftover bit really close to the knot and then burn the end with a lighter to help seal it. There are thousands of how to articles, videos and tutorials on how to tie a bowline, if you’re having trouble with I provided a step-by-step below. Make a loop with the loose end on the top. Take the loose end and feed it under and through the loop you just created. Wrap it around the other part of the rope. Make the loose end go right down the first loop again. Pull it tight. Here you may need to slide different parts of the rope to get it the size you want. 4. Feed the carabiner through one end of the rope, slide the tape on, and close the loop by feeding the other end of the rope through the carabiner. That’s it! Rejoice in your new convenient, tape lanyard carrier. 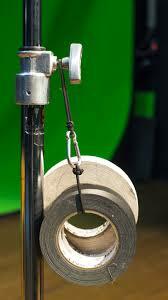 Now you can hang tape on a c-stand, tripod hook, or your belt! Make more for your friends, give them out for Christmas, everyone will love you for it. This is the wrong way! Don’t do it!